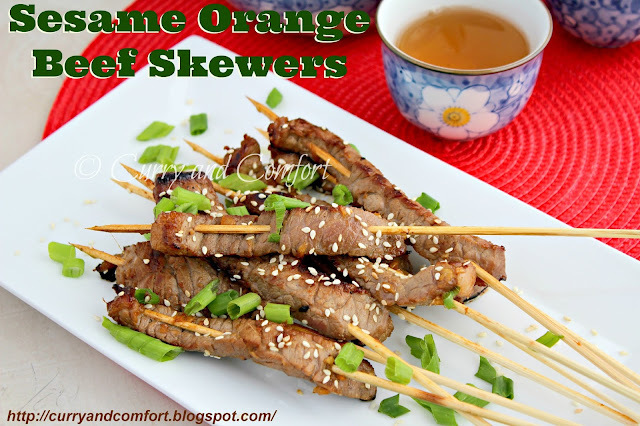 This Sesame Orange Beef skewers are an easy appetizer with a lot of flavor and "wow" factor. When you put this on the table... everyone stops talking because they are making a bee line straight for these tender slices of beef that have been marinated in a citrus Asian marinade. I made them just for my family and all I had was a bunch of empty skewers left in a matter of minutes. If you want to make this into a meal, serve it with some fried vegetable rice. Cut beef into 1/4 inch thick beef strips against the grain of the meat. 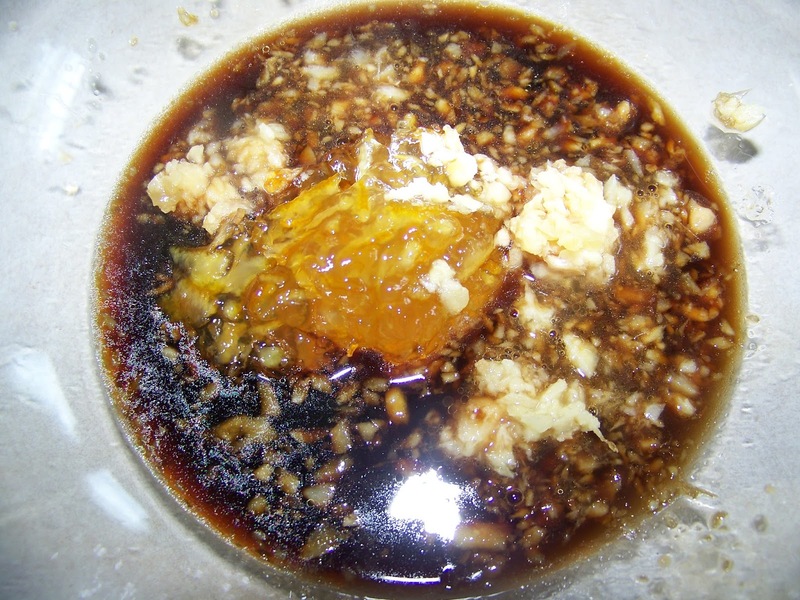 Marinate in marinade for 4-6 hours. Thread on skewers. Heat a griddle or grill pan on medium high heat with 2 Tbs canola oil. 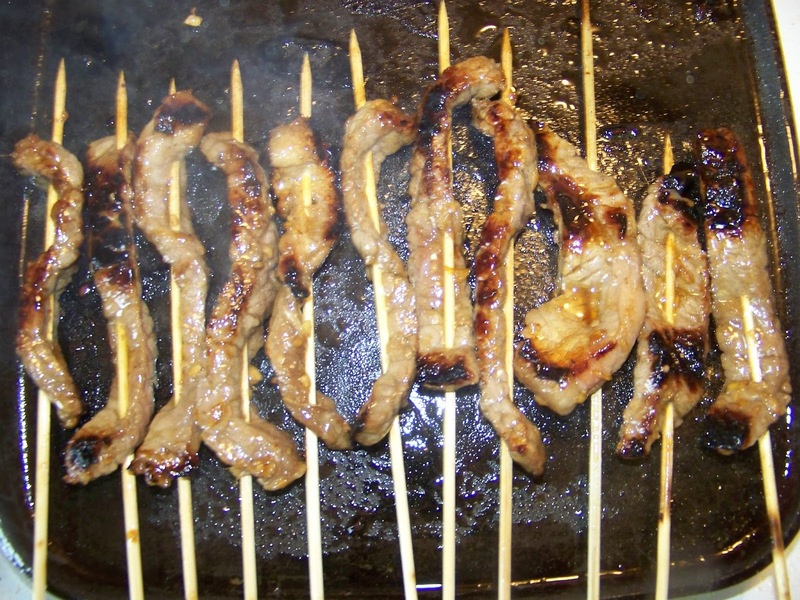 Fry on both sides until cooked to desired internal temperature. 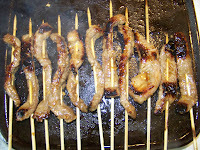 You can also grill these on the outdoor grill if desired. Garnish with toasted sesame and green onions. Serve warm. Enjoy. Hi Ramona! 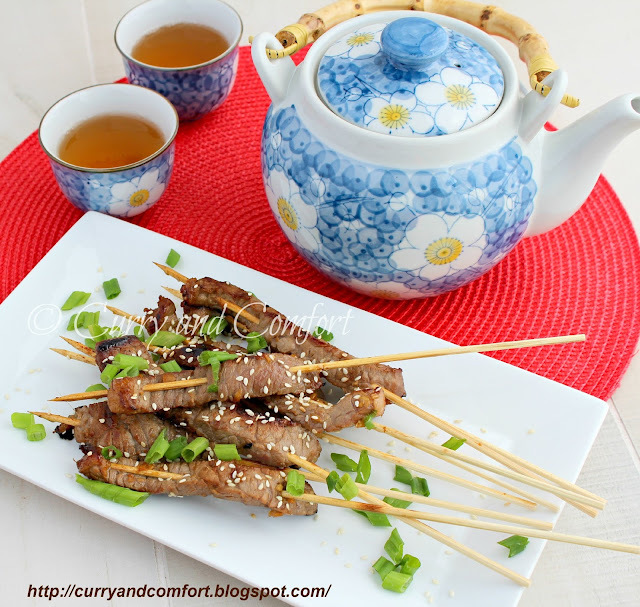 Your marinade for these beef skewers look delicious! I use orange marmalade to make variation of teriyaki sauce and kids love it. I am sure this recipe will be popular with them too! 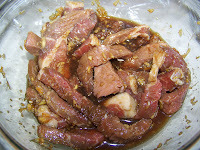 I love this idea for flank steak...which I always have in the freezer. The marinade looks fantastic! Those skewers look delicious, terrific recipe! Love the sound of your marinade! Perfect for delicious beef skewers! The marinade sounds so flavorful! The marinade sounds really good. Like how you've used sesame seeds to garnish, this would go well with chicken too. This is definitely going on the dinner menu, thanks! I'll be right over. Save me 3, or like 4, or maybe 5. No doubt that they are wow factor, just look at them and the the sound of orange makes me want to take them out of the display Ramona. They would go like hot cakes in the Wednesday flee market here. I think the flank steak is my favorite cut of beef so I'm always looking for ways to use it. 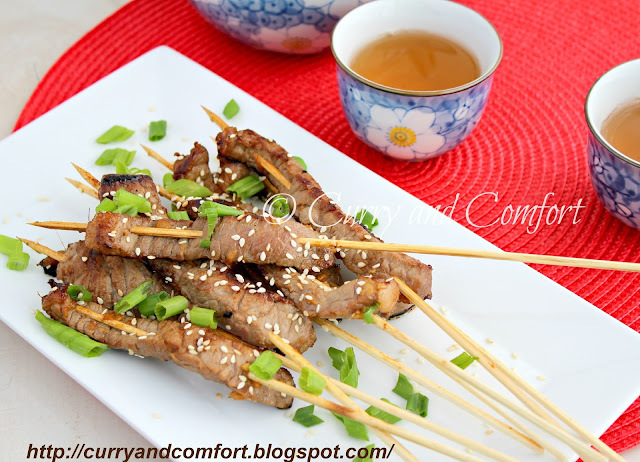 I love, love, love these skewers and know that Bobby and I too would finish off a batch in one sitting. Your photo with the tea pot is great. Love your presentation and I would find a plate of empty skewers as well. I will have to omit the sesame seeds because Gabbi can't eat them.